Caitlin Smith's new album, due for release in May, was originally called Easier Said Than Done. The title, she says with a wry smile, was prophetic. Extortion, a phone company erasing song “seeds”, drummer dramas and studio nightmares were just some of the obstacles that delayed the release, she says. Now, however, she is looking forward to the launch of her second solo album, renamed You Have Reached Your Destination. A nationwide promotional tour is planned for 2010 and 2011. She also plans to reach an international audience by performing overseas at arts and music festivals. 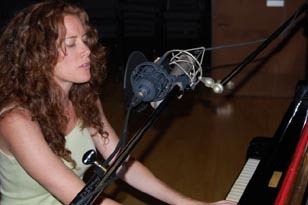 A $15,000 New Work grant from Creative New Zealand enabled Smith to record the 14 original songs on her new album. There are songs about alcoholism, co-dependency, love, loss and “blind faith”. Described in the media as “one of Auckland best-known jazz vocalists” or an “icon of the New Zealand music industry”, Smith describes herself as a “song poet and performer”. Watching her perform, there is no indication that she’s partially sighted – except when she tells her audience. With 10 per cent vision in one eye, five per cent in the other, total colour-blindness and extreme light sensitivity, Smith builds rapport with her audience, and delights with her extraordinary voice, storytelling and musicianship. Arts For All: opening doors to disabled people, published by Creative New Zealand in partnership with Arts Access Aotearoa in late 2009, features a photo of Caitlin Smith in full voice. Here, she talks about the importance of asking people what their access needs are rather than making assumptions. For her, access is as much about accessing the means of production (vocally, musically and creatively) as it is about access to other artists’ work. A full-time professional musician, Smith performs at least twice a week, and is a voice and songwriting coach. She also writes the column Finding Your Own Voice for the New Zealand Musician magazine. Her students have included Nesian Mystik, The D4, The Datsuns, Ardijah and Anika Moa, and she has taught at several tertiary institutions in Auckland. Original generation time 1.2887 seconds. Cache Loaded in: 0.0005 seconds.